We're used to seeing Apple engaged in patent lawsuits, often as the plaintiff, although occasionally as the target. 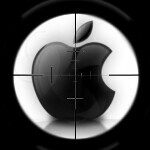 However, this time FlatWorld Interactives has targeted Apple, and targeted the company in a big way. And, of course this has to happen just after Tim Cook goes on record saying that he hates litigation. FlatWorld Interactives holds a patent related to touch-based interactive museum displays, and it is claiming that all of Apple's touch devices - iPhone, iPad, and Macs using a Magic Mouse or Magic Trackpad - infringe on that patent. Apparently, the patent was granted back in 2005 and FlatWorld has only used the system described twice. The patent describes a system where you can "throw" objects off a screen when the "velocity of the touch exceeds a predetermined threshold," and describes certain gestures, although supposedly none of the gestures matches those used in any Apple device. Adding to the suspicious nature of the claim is that even though the patent was granted in 2005, FlatWorld wasn't even incorporated until a couple of weeks after the iPhone was announced, and the patent request was reissued in July of 2007 with a few modifications. Overall, it doesn't seem like this is much of a threat to Apple, but if Tim Cook says he prefers settling, it's likely that more of these types of suits may come Apple's way. At least they have their own patent, unlike Google who stole it and distribute them to Android manufacturers as if its their own. I think you actually mean "slide to unlock.". You know, that thing that was invented and used well before Apple patented it as if it was their own and started suing everyone over it. Scratch that part about EVERY smartphone or tablet, not sure what a Magic Mouse or Magic Trackpad is...still dumb that companies and their lawyers think they can feed off of Apple (or any company) in the hopes for some out of court settlement. Rambus anyone? No, the only thing ridiculous is US patent system. Come on, how can a company get a patent that is already used in another device? Make a f* database, US and stop wasting everyone's money. In EU Apple's patent claims almost never got answered because of a different system, in Asia is the same thing; the only problem is in US market. So this will affect only the smartphones sold in US because FCC - if I'm not mistaking - does a lousy job. As I recall, the patent war started in Germany between Apple and Samsung, then travelled around the world. The U.S. was the last stop on their global tour. So it seems the international patent system has some work to do. And you can make any product you want. It's the responsibility of the original patent holder to realize you're using their ideas. It is overly broad. They should only sue for valid issues, like rectangle shapes and black bezels. Our friend from Xerox was ahead of the curve: http://www.youtube.com/watch?v=S8lCetZ_57g Not to mention the other companies that put that idea to fruition and expanded upon it. I was really beginning to think this video was barely related to the topic, when the fellow opened a book on the desktop, used a multitouch gesture to highlight a paragraph in the book, and dragged and dropped it in his presentation. Apple ripped alot more than the GUI off Xerox. Looks like Xerox were the real geniuses. Patent "using the middle finger to do the screen unlock"! And here is a gem I just saw on Phonescoop... "Apple iPhone Violates Motorola Wi-Fi Patent"